Some of these chakras are just emerging on the Earth plane, but have been chakra points in the spiritual body all along. It is only now that we have raised the vibration of the planet and ourselves to a place where these new chakras can emerge in our physical world. This change is directly related to our collective Ascension process. Read more below. This chakra upgrade is being rolled out in 3 stages: Forerunners, Second Wave Awakeners and Humanity in Entirety. For new and emerging chakras, information on timelines will be given for all 3 groups. These three groups are loosely classified by the timeframe at which one’s spiritual awakening process began. Forerunners are those who began their awakening process prior to 2012. Second Wave Awakeners started their journey between 2012-2016. The last group is designated for everyone else. As each group reaches a new milestone, it makes it easier for the next group to anchor in the new energy. No matter what wave someone is in, the events will be experienced in the same order. Some steps can take place simultaneously. The steps with an asterisk, are what different individuals are currently experiencing. Forerunners will be near the end of the asterisks, Second wave will be somewhere in the middle, and everyone else will be near the top of the asterisks. If you want to read about where these new chakras are on the planet, check out this new article. 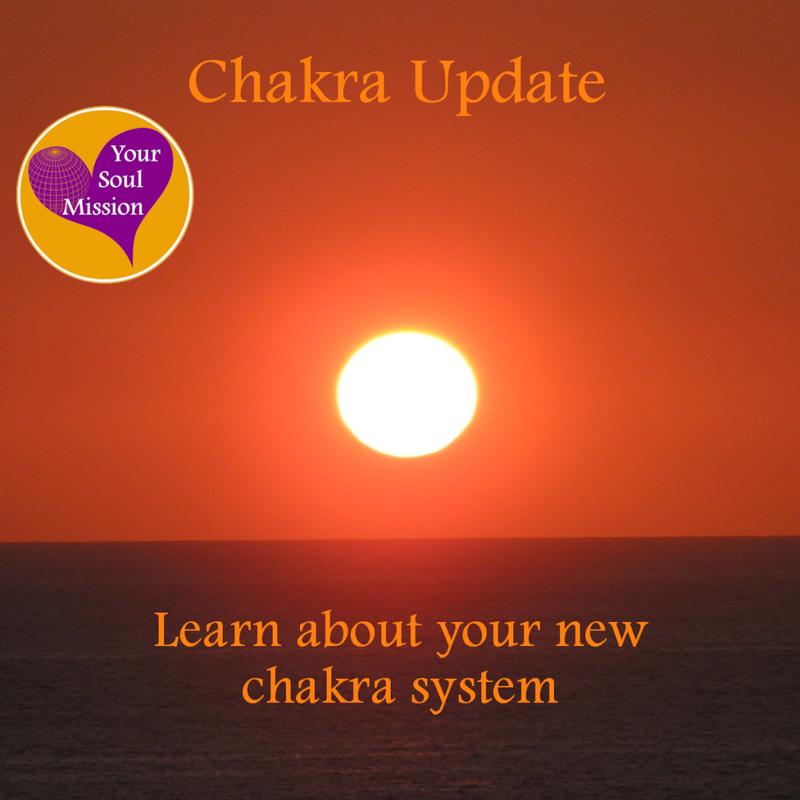 Check out this great article for a more concise version of the chakra upgrade information on The Hearty Soul. Further information on each of the chakras is explained below. Need some extra help with cleansing, clearing and aligning your chakras with the New earth energy? I have developed a course that works on each of the chakras to release the old and make way for their new purposes. Read more about the Chakra Ascension Courses. The content of this page was originally written in November 2010, and has been migrated from our original website, Aurora’s Message. Additional updates are noted. Please read our 7/5/2017 update below. **Please note, since the most original posting of this page, our timeline has dramatically sped up. This is because of all of the hard work that everyone has been doing to focus on healing, Love and unity consciousness! Update 9/20/18: The timeline for completion of this process has stalled slightly, waiting on disclosure of certain truths to take place. We expected this to be done by January 2018, and now we remain on hold for this to finish. As of today, we expect this entire process to be completed by the March Equinox of 2019. For that to happen, that would mean disclosure will need to take place before the end of 2018. If that does not happen, then our timelines will continue to be pushed out. You can help the process reach its conclusion by focusing on peaceful and smooth disclosure, as well as participating in mass meditations. Foot Chakra – The color for the Foot chakra is a brownish-red, like the color of brandy. The Foot chakra is for anchoring the soul to the Earth plane and also is associated with the strength to walk forward on one’s life path. The Foot chakra is located in the center of the sole of each foot. With the changing of the Earth’s vibration, the Foot chakra becomes necessary to connect us to the old reality, so that we can safely connect to it when we need to. The Foot chakra is also called the Earth chakra. This is active in all groups as of May 2015. Updated 5/29/15. Sacral Chakra – The color associated with the Sacral chakra is a deep orange. The Sacral chakra was the chakra of fertility, both for human life itself but also for Manifestation, creativity & success in arts, music and other endeavors. The Sacral chakra was what pulled an idea from the upper chakras into physical form. This duty will now be handled by the Hands chakra. The Sacral chakra was located about 2 inches below the belly button. This chakra is now gone, as the Belly Button chakra has taken over for both the Sacral and Solar Plexus chakras. Many children who are being born today with digestive issues are born without either the Solar Plexus or Sacral chakras, which is a sign of the evolutionary process of our spiritual bodies. The energy was shifted in the groups as listed. During this shifting process, you may have experienced digestive discomfort and pressure in the sacral area. The release in the Sacral chakra could have also been accompanied by the release of deep fear, especially fear of lack. This chakra is gone for everyone, as of October 2016. Updated 10/26/16. Hands Chakra – The color for the Hands chakra is gold. The Hands chakra is associated with giving and receiving things to/from the physical world such as wealth, knowledge, kindness, healing and so forth. When the Hands chakra is closed off, the person will have a tendency to dwell in victimhood or become withdrawn from the world and even miserly. This will be because of some perceived wrong from a past life or past experience. The Hands chakra is the physical extension of the manifestation process, and is located in the center of the palm of each hand. As the Hands chakra takes on all of its new duties, you will feel pulsing, itching and even aches in the hands. This chakra is active in everyone as of May 2015. Updated 5/29/15. Solar Plexus Chakra – The color associated with the Solar Plexus chakra is yellow. The Solar Plexus chakra governed how we define ourselves and is associated with self-worth, self-confidence and self-esteem. This was also where the majority of the fears from other lifetimes were stored in the physical body. The Solar Plexus chakra was located about 2 inches above the belly button. This chakra has gone away altogether, as the Belly Button chakra has taken over for both the Sacral and Solar Plexus chakras. Many children who are being born today with digestive issues are born without either the Solar Plexus or Sacral chakras, which is a sign of the evolutionary process of our spiritual bodies. As the energy was shifted, deep fears were purged from the body. Symptoms did include overwhelming anxiety, and fears that you can’t quite determine why they are creating such fear within you. It is like you mind knows not to be fearful of a certain situation, but no matter what you do, you cannot help but feel fearful anyway. The fears released from this chakra included fear of abandonment, betrayal, being physically hurt, or a fear of being dependent on others. This chakra is gone in everyone as of October 2016. Updated 10/26/16. Lower Heart Chakra – The color for the Lower Heart chakra is olive. The Lower Heart chakra is associated with having love for oneself. The Lower Heart chakra is located at the base of the sternum. This chakra is assisting in the Heart chakra shift. Once the Universal Love chakra reaches full capacity at the heart center, the Lower Heart chakra will be re-absorbed back into it. All 3 groups will have the same experiences with the Lower Heart chakra, as it is a temporary chakra to assist in the changing over of energies. Think of it like scaffolding for the new chakra system. This chakra has now been absorbed back by everyone as of June 12, 2017. Updated 6/12/17. Heart Chakra – The colors associated with the Heart chakra are emerald green and rosy pink. The Heart chakra is the area of our body where we give and receive love to/from others. The Heart chakra was located in the center of the chest, about 3 inches up from the base of the sternum. It has now merged with our Root chakra, and is located in the former Root center. The Universal Love chakra is now occupying the space where the Heart chakra was once located. After about 1 month of merging with the Universal Love chakra at the heart center, the Heart chakra began its descent down toward the Root chakra. For the 1 month of overlap, you could have experienced an expansiveness in the chest are that you have never felt before. This was often accompanied by coughing, intense internal heat, low fever, heart fluttering, and other signs of energy release. As the Heart chakra migrated to its new location, it acted as a firehose to force out any hidden emotions/energy in the lower chakras that are inharmonious to the new higher frequency of the planet. You may have experienced abdominal fluttering, muscle twitches, flatulence, stomach pressure and frequent bathroom trips during the time of the Heart chakra’s travel to the Root center. For all groups, the Heart chakra is now at the Root center, and has completed its merging. This was done as of April 2017. Updated 4/2/17. Lower Throat Chakra – The color for the Lower Throat chakra is turquoise. The Lower Throat chakra is associated with channeling, soul streaming, and in bringing communication from spirit into the physical realms. The Lower Throat chakra also brings your own truth into action, so not only do you speak it, but you also live it. The Lower Throat chakra worked in partnership with the Hands chakra and was located at the center of the collarbone. After the Spiritual Communication chakra merged with the Throat chakra, the Lower Throat chakra was re-absorbed into the throat area. Because this is the other temporary chakra, (with Lower Heart) it only remains active for a short time before merging back into the new Spiritual Communication chakra. This process completed by July 2017. Updated 7/5/17. Throat Chakra – The color of the Throat chakra is a deep blue. The Throat chakra is associated with speaking one’s truth and physical communication with others. The Throat chakra was located at the Adam’s apple in the throat area. The Throat chakra has changed over to the Spiritual Communication chakra, and the Lower Throat chakra has been re-absorbed into it. As the Spiritual Communication chakra merged with the Throat chakra, you could have experienced a double voice, as well as more telepathic broadcasts out to others. You also might find that as you released the Throat chakra energy, that you have words spoken out of your mouth that cannot be held back. This process was completed by July 2017. Updated 7/5/17. Nasal Chakra – The color of the Nasal chakra is navy blue. The Nasal chakra is associated with being receptive to the communication of others as well as Spirit, and with the senses of smell, taste and hearing. As this chakra opened, much of the energy was cleared through nasal congestion and stuffy noses. This chakra was created so that the Third Eye could be entirely focus on vision (both physical and spiritual). The Nasal chakra is located at the tip of the nose, and is responsible for smell, taste and hearing. This applies to both physical and spiritual forms of these senses. When this chakra is open, you will smell more mystery smells (both pleasant and not so pleasant). These smells are mostly associated with guides and Higher Energies. You can also smell the decay process of the dismantling of the 3D world, as well as your body expelling inharmonious energy. (both not pleasant smelling!) Hearing on both a physical and spiritual level become more fine tuned, and you may discover that you no longer have the taste for foods you once enjoyed. This is the chakra that receives the telepathic signals sent out by others, and works with the Third Eye chakra for this purpose. All work on the Nasal chakra was completed by December 2015. Updated 3/31/16. Third Eye Chakra – The color of the Third Eye chakra is indigo. The Third Eye chakra is associated with physical and spiritual sight and also the dreaming state. It is where seeing the energy of the spiritual realms is possible. The Third Eye chakra is located in the center of the forehead, and is what allows for clairvoyance and spiritual sight. The Third Eye chakra works with the Nasal chakra to be a receptor for telepathic communication. No chakra is replacing the Third eye, but it will have a much more focused purpose. This work has been completed in everyone as of June 2016. Updated 8/17/16. Crown Chakra – The colors of the Crown chakra are purple and white. The Crown chakra is where the connection to Spirit occurs and is where the spiritual energy enters the physical body. In the new energy, the Crown chakra becomes much larger, almost like a column of light that will extend upward to meet the Ultimate Being chakra, before they eventually become one. The Crown chakra is located in the center of the top of the head. As the Crown chakra connects with the Ultimate Being chakra, you can experience sensations like, being pulled out of body, feeling ungrounded, and feeling as if you are much taller than your physical body. Forerunners and second wavers have completed the merging of the 2 chakras as of February 2017. Everyone else is beginning to experience this merging. This process begun in late May of 2017, but is in a standstill until disclosure takes place. Before this last round can be completed, there will have to be the release of many hidden truths, otherwise this last group would not be ready for the change in perception that can come with this particular chakra merging. It is in holding until disclosure begins. Updated 9/20/18. Universal Love Chakra – The color of the Universal Love chakra is magenta. The Universal Love chakra is where interconnectivity to all living beings is fostered and is the place for unconditional love. It can be considered the Heart chakra of the spiritual body, and that is why it is taking over for the traditional Heart chakra, as humanity continues to raise its vibratory state. After about 1 month of joining at the heart center, the Heart chakra began its descent down toward merging with the Root chakra. For the 1 month of overlap, you may have experienced an expansiveness in the chest are that you have never felt before. This was often accompanied by coughing, intense internal heat, low fever, heart fluttering, and other signs of energy release. This change in the Universal Love chakra has already taken place. The activation of the Universal Love chakra often was accompanied by a purging effect of anger, sadness, hopelessness and other deeply powerless emotions. The presence of the Universal Love chakra acts as a catalyst to pop out any emotion that is not of resonance with unconditional love. The Universal Love chakra is now active at the heart center for everyone. Updated 10/26/16. Spiritual Communication Chakra – The color for the Spiritual Communication chakra is a silvery-blue, and it started out about 18 inches above the head. The Spiritual Communication chakra is where the Higher Self communicates with the spiritual realms and is where telepathy will be able to take place. It can be considered the Throat chakra of the spiritual body. This is where beings in the world of Spirit transmit communications to one another. This chakra is now taking over for the Throat chakra in the body. This completed its merge for the final group in July 2017. Updated 7/5/17. Ultimate Being Chakra – The colors for the Ultimate Being chakra are gold and clear. The Ultimate Being chakra is where the connection with God/Source/Ultimate Being occurs. It can be considered to be the Crown chakra of the spiritual body, and is merging with the current Crown chakra. The Ultimate Being chakra starts out about 3 feet above the top of the head. It is quite a large chakra, having a radius of 18 inches. We experience the merging of the Ultimate Being chakra and the Crown chakra when the outside perimeter of the Ultimate Being chakra begins to touch the center of the Crown chakra. This chakra can also be called the God chakra, or Soul Star chakra; it is our connection to Oneness and All-That-Is. As the Crown and the Ultimate Being chakras merge, you will notice that your ability to tap into esoteric knowledge increases, or that you just seem to “know” something to be true. Eventually there will be no need to practice discernment in the same way, because you will be able to recognize both truth and un-truths for exactly what they are. Another benefit of the connection of these chakras is the facilitation of remote viewing, and bi-location. When you are connected to your Ultimate Being chakra, you can connect with the grid of time, space and the multiple dimensions of all Universes, should you choose to do so. There will be a learning process for you to re-learn the ancient esoteric practices once again, and only once all have transitioned all chakras. During the merging process you can have moments of extreme vertigo, spacey-ness, and feeling ungrounded. Forerunners have completed the transition to the Ultimate Being chakra in August 2016. Second Wave have completed the transition to the Ultimate Being chakra in April 2017. Everyone else is just beginning the descent of the Ultimate Being chakra. This process begun in late May of 2017, but is in a standstill until disclosure takes place. Before this last round can be completed, there will have to be the release of many hidden truths, otherwise this last group would not be ready for the change in perception that can come with this particular chakra merging. It is in holding until disclosure begins. Updated 9/20/18. Full Body Assimilation – After all of the new chakras are aligned and active, the whole body will experience an assimilation of the new energies. This feels like electrical pulses, vibrations in the body, heat/cold cycles and is also associated with a movement into even more heightened awareness/intuition. This is our upgraded chakra system coming online fully with the New Earth grid. You will know when you are completely upgraded, as you will experience the final activation, as described below. Forerunners are fully assimilated and activated as of 11/11/16. Second Wave completed their assimilation on 6/22/17. Everyone else is to experience this once their Ultimate Being chakra merging is fully complete, after Disclosure. Updated 9/20/18. Final Activation – This is a electrical pingback that travels down from the Ultimate Being chakra into the Earth and back up the central meridian again. You will likely experience one or two “test” pingbacks before the final one. The pingback is an electrical surge down and then back up through the body. The successful pingback is quite effortless, whereas the test pingbacks can feel slightly uncomfortable. Once you have a successful pingback, you are all done! Think of this step as a big electrical switch being turned on. Forerunners have all completed this activation as of 11/11/16. Second Wave has all now achieved their activation as of 6/22/17. Everyone else is to experience this once their Ultimate Being chakra merging is final, after Disclosure takes place. Updated 9/20/18. After everyone has completed those necessary parts to the chakra upgrade process, we will be able to complete our Shift of Ages. The other parts of the chakra upgrade process are able to be completed only after certain parts of the Ascension process (Disclosure). We have sped up the original timeline dramatically with our choices as a collective unit, and now we are waiting for Disclosure to take place. The more you connect with your own chakra system, and then visualize a smooth transition for all, using your own system as a mirror for all of humanity, you can help everyone in arriving at our destination just that much sooner. Positive timeline adjustments have been made to nearly every update to this page. With your positive focus and intention, we are almost there! Please share this page with those who you feel made benefit from this information. Thank you. Want to learn more about what information is inside of your chakras? Experience a Full Chakra Clearing, and clear out the past life energy influencing you today. Learn more about Chakra Clearing here. Great info Karen. Thank you! Thank you so very much Karen. Timely as ever. Loving blessings of Light as always. P.S. I’m emailing the more “wordy” ‘expression of gratitude’. So grateful for this information Karen. Now I understand my confusion between the solar plexus sacral and the belly button. I always felt like the sacral and solar plexus are redundant and the belly is left out, and now I find my answer. Much gratitude Karen. Hi how will I know if my chakras are closed or imbalanced and what should I do to fix/align them? Hi Teresa, One of the best methods to self-diagnose your chakras is through the use of a pendulum. Stand, and hold it in front of each of your chakras. When a chakra is flowing properly, you will see a nice small circular movement. When a chakra is closed, you will see either no movement, or very little movement. To fix/align,there are several methods that can help, including sound therapy, color therapy, meditation, acupressure/acupuncture, and so forth. Color therapy is the best for a DIY approach. You take a piece of clothing/fabric that matches the color of the chakra and place it over that area for an extended period of time. Adding a similar color crystal can also assist. This is a gentle process, but very effective. Hope that helps! I have been feeling my throat chakra for the past 2 weeks. Does anyone know what could be happening?! Hi Diala, You are experiencing the emerging of our throat chakra with the spiritual communication chakra. This can be accompanied by extra sensations in the throat area, sore throat, coughing, excessive swallowing. It is a normal part of the chakra upgrade process. 🙂 Let me know if you have any other questions. Hello Karen, thanks a lot for great insight. My ascension experience started in 2011, so am I considered forerunner? My awakening only happened in march 2016, it was sudden and explosive it came out of no where. I new nothing about kundalini or chakras before this happened. I’d never even meditated. After researching and experiencing so much stuff I began to understand. I still don’t completely. One thing that stands out though is. My chakras never had to merge. They have always been that way. It may not be of any relevance but as a child and still till this day obviously. My heart has always beated from the centre. Also I can feel my pulse from my finger tips. All of them! Is this something everyone feels? I was born without a root chakra, so how the hell does my spirit stay in my body!? Any ideas????? The usual 7 chakras each have a place on earth. After a meditation, particulaly inerested in soul, and earth star, place on earth grid. Google aint helped, but lead me to yr site. That is a fabulous question! I will meditate on it and get back to you. I will bring all of the new chakras through with their locations. Could you please send me an email at karen (at) yoursoulmission (dot) com ? That way I can email you back with the information. I will also write an article about it, but that may take until the weekend to finish and publish. Thank you! We at March 2018 and no where near Ascension and still the body is hurting. I have experienced all these symptoms, events and understandings described but humanity is to slow in transitioning. We must remember these symptoms can also arise from chemicals in food, chemtrails, pharmaceuticals, wi fi, electrical emissions, fluoride in water, plastics, oestrogen and may have little to do with actual ascension at all. I do hope I am wrong but Jan 2018 has passed and we have not reached this new world yet.